Timed to coincide with this year’s Cinema Expo conference being held in Amsterdam through Thursday two well known integrators have released enhanced versions of their theatre management systems (TMS). 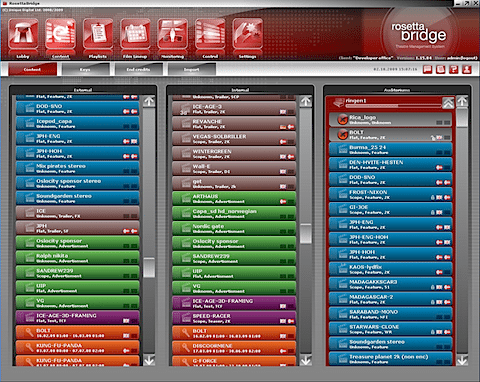 North American deployment entity Cinedigm has included centralized management features in their Theatre Command Center TMS and Norway’s Unique Digital is making the next version of their RosettaBridge software available. A TMS is software that enables a multiplex to manage all of their digital cinema servers, projectors, content, security keys and logs within a given theatre, all from a central location. It is often attached to a library management server where d-cinema content is stored. Management of all content including MPEG, JPEG, trailers, preshow and alternative content. Ingest of content via any delivery method including USB, satellite and fiber optic wire. Remote operation of servers and projectors. Automated scheduling of playlists that allowed for the transfer of content to the correct screen. Integration with some point-of-sale systems as well as Cinedigms head office software. Web access allowed users to log in from any computer connected to the Internet. Real-time monitoring of d-cinema systems with system status alerts and notifications. Some of this functionality, such as content management and ingest, would be considered basic requirements for any TMS, no matter the manufacturer. Most of those who have been using the software that I’ve spoken with have had positive things to say about the software. The only consistent criticism I’ve heard is about the systems graphical user interface (GUI). I’m not familiar enough with Cinedigm’s TMS to add my own thoughts. Originally Cinedigm’s TMS was developed for exhibitors who signed up with them to deploy d-cinema equipment. Last year, the company decided to make the system available for sale to any theatre owner who wished to use it, whether they were using Cinedigm as an integrator or not. This was a model that other deployment groups such as Arts Alliance Media and Unique Digital had already adopted. Based on the press release announcing the release of Theatre Command Center-Enterprise (or Enterprise as it has been dubbed) it is hard to tell what some of the new features and benefits of the software are. From what I can tell, it’s a TMS for TMS’s. Meaning, if you are an exhibitor with multiple theatre venues, Enterprise provides a view into the TMS’s located at all your sites. Such functionality would enable the consolidation of real-time data flowing back to a head office. Real-time events and statuses from all networked digital theatres are captured in a robust central Enterprise database for unprecedented operating control and business intelligence. Enterprise also centralizes preshow scheduling and content management functions to eliminate repetitive theatre tasks, improve consistency and control and reduce specialized resource costs and weekly setup time. Enterprise will also streamline and automate the calculation and reconciliation of virtual print fees. Don’t underestimate the last point about keeping track of VPFs. It’s one thing to keep the books for a VPF when you have a handful of screens, but it can be rather complicated when you convert entire multiplexes and have to maintain proper accounting for equipment across dozens if not hundreds of screens. In fact, this was a feature included by Unique Digital early on when they were developing their version of a TMS, RosettaBridge. The company released version 1.5 of their software late last week. Automatic ingest of content by USB, FTP, CD/DVD, network drives and fiber optic wire. Playlist creation that allows for inclusion of content not present at the theatre yet. Automated KDM management including alerts for keys set to expire. Integration with d-cinema equipment from all major vendors. Web access from any computer connected to the Internet. Automated scheduling of playlists and content transfer. Log management for any device connected to the TMS. Integration with a scalable library server. I have been given a demonstration of RosettaBridge and what stood out was the system’s slick GUI. Uniques TMS can be run from a touch screen with simple drag-and-drop functionality. It was pretty easy to get a quick visual overview of system health and state, as well as available and expired content with a Christmas trees worth of flashing icons. Like certain pieces of software for the Mac, it just looked pretty. Speaking of which, since the software is written in Java, it can be run on any platform, Mac or PC. I can’t vouch for how well Unique’s TMS works as I haven’t spoken with anyone whose used it for any length of time. The company is presently busy installing it in multiplexes all over Norway which they are presently converting to digital. When they’re done their TMS will be managing about 350 screens. As mentioned previously, Unique is making the software available for purchase to all theatre owners, regardless of integrator. Key new features include the ability to schedule multiple content ingests via the Content Management Transfer Module (CMTM) and integration with the latest GDC and Dolby software versions via their web based API’s. In addition the new version includes a film booking management system that ensures changes made in either the server or TMS are continuously synchronized across the network.